When we think of February, Valentine’s Day comes to mind as does the beginning phase of leaving winter behind. While it is still quite chilly, I think we’re all mentally preparing for the warmer days ahead of us. We wanted to take color inspiration from something soft, whimsical, and full of color. We started looking at gardens and different types of flowers when we landed on some stunning photos of lavender wisteria. We love this range of purples! It is the perfect way to enter spring, yet wisteria still has this illusion that there is snow fallen into it: perfect for February. A good lavender-gray can be used as an accented neutral in a home (such as “Gentle Grape.”) Other shades that coordinate with it well are bright whites, shades of orange, warm yellows, lime green, and both gold and silver. 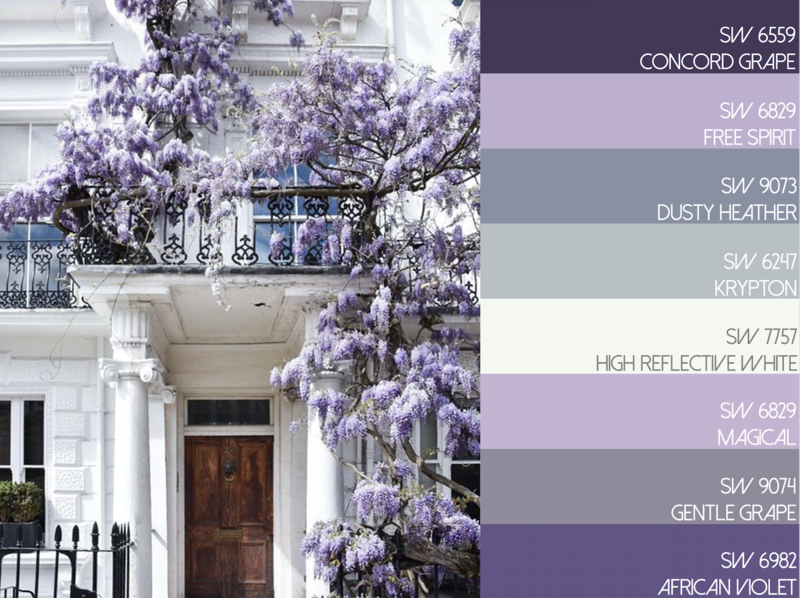 As always, we created this color palette with the help of Sherwin Williams Color Snap App.